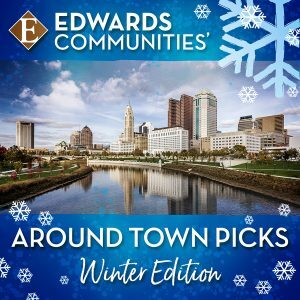 December is an exciting time in Columbus, Ohio, filled with anticipation and traditions that are sure to put you in the holiday spirit! Countless activities, events, and musical performances provide hours of entertainment and memories for you and your family. So whether you live in Columbus or are visiting family or friends in the area, we know you can find something fun to do in our city! Stop by Columbus Commons from dusk until dawn to see more than 320,000 LED lights dazzling in the park. Free hot chocolate and carousel rides will be offered each Friday, with roaming carolers spreading the holiday spirit with your favorite seasonal songs. Featuring all new displays and entertainment, the Dragon Lights Columbus will get you in the holiday spirit with light sculptures, exciting performances, Chinese and traditional fair food, and a fun cultural experience. Visit their website for times and ticket information. Take a festive ride around the city to get a first-hand glance at our most impressive holiday lights displays in the area! The trolley will stop at the Columbus Zoo WildLights before heading to Dublin, Upper Arlington, Downtown Columbus and the Scioto Mile. Light appetizers will be served prior to the trip, but bring your own beverage for the trolley ride! Santa, reindeer, animated musical light shows and millions of LED lights make Wildlights Central Ohio’s favorite holiday tradition. Join us for another year of holiday fun all around the zoo with holiday rhythms around the watering hole, Rudolph and friends, Polar Bear Express, Santa’s holiday home, animals in their natural outdoor habitat, and much more. The Columbus Blue Jackets have home games scheduled this month against the Calgary Flames, Washington Capitals, Los Angeles Kings, Vancouver Canucks, Anaheim Ducks, Vegas Golden Knights, New Jersey Devils, Toronto Maple Leafs and Ottawa Senators. Get ticket information on their website. Celebrate the holiday season with timeless hits from the pop group Abba as they tell the entertaining tale of a young woman’s search for her birth father the night before an Aegean paradise. Tickets to this feel-good musical can be purchased on their website. This beloved holiday tradition takes you inside the earnest and imaginative dreams of young Clara as she journeys with her Nutcracker Prince to meet the Sugar Plum Fairy. Come and listen to the angelic sounds of young voices singing the traditional sounds of the season in a beautiful setting! The performance is free with paid admission to the Franklin Park Conservatory. Now in its 20thyear, the Trans-Siberian Orchestra features Paul O’Neill’s timeless story, “The Ghosts of Christmas Eve,” about a runaway who finds her way into a mysterious abandoned theater. Get your tickets to this multi-sensory extravaganza on their website. The world famous Harlem Globetrotters will show off their ball handling wizardry, rim-rattling dunks, trick shots and unequaled fan interaction at this exciting event. Showcasing the high-flying, fun, and memory-making moments, the Globetrotters will be celebrating the special blend of basketball and entertainment that has made the team iconic. Tickets are available for the 1 p.m. and 7 p.m. show. These are just a few of the fun events offered in December in our exciting city! You can learn about other events by visiting local websites such as Experience Columbus and Columbus Underground. And if you’re considering making Columbus your new home, check out the beautiful, upscale, amenity-filled communities available with Edwards Communities! We have communities in downtown Columbus, near OSU campus, Capital University and in the suburbs. We invite you to visit our website or tour any of our communities so you can experience for yourself the beauty, charm and quality that is Edwards Communities!